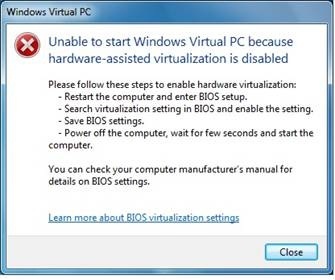 One of the original system requirement (part of Windows 7 system requirements) for Windows Virtual PC (and hence Windows XP Mode) is that CPU must support hardware-assisted virtualization (HAV) and has the feature turned on or enabled in BIOS. The Windows Virtual PC (VPC) designed specifically for Windows 7, take advantage of HAV support on processor to improve the performance of virtualization technology (VT) when the virtual machines are powered on. 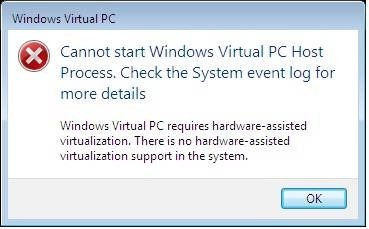 This error message indicates that the hardware-assisted virtualization (HAV) feature is not enabled on the computer. This error message indicates that the processor does not support the HAV feature. This error message is displayed when user tries to start or configure a virtual machine that is not running Windows XP Mode. This error message indicates that the processor does not support the HAV feature. To make virtualization more accessible to many more PCs for small and midsize businesses wanting to migrate to Windows 7 Professional, Ultimate and Enterprise, while still running Windows XP-based productivity applications, Microsoft decides to remove the hardware virtualization technology prerequisite requirement in order to run Windows Virtual PC. It means that any PC with Windows 7, and with the hack for Windows 7 Home Premium, Home Basic and Starter to install Windows Virtual PC and Windows XP Mode), everybody can install and run Windows Virtual PC to power up any (virtual machine) on any computer and system. To enable Windows Virtual PC and Windows XP Mode on computer without hardware virtualization support, Microsoft releases KB977206 Update for Windows 7, which removes the prerequisites required to run Windows Virtual PC and XP mode. The prerequisites include a processor which supports hardware assisted virtualization (HAV) which is also enabled in the BIOS. Note that if your current system already installed with and can run Windows Virtual PC and Windows XP Mode, the update is not required and not necessary. Windows Virtual PC will still take advantage of hardware virtualization support if it’s available. 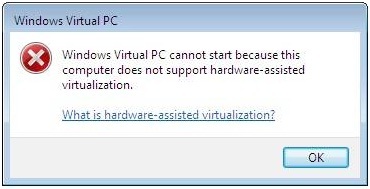 In fact, Microsoft says that while customers can start using Windows Virtual PC to run Windows XP Mode or create virtual machine running Windows Vista or Windows 7 without having to worry about hardware virtualization, HAV is still recommended for later case as the non-HAV is only supported and tuned for XP Mode. Download KB977206 Update from Microsoft Download Center (32-bit or 64-bit). Windows Genuine Advantage validation is required, or else just download the setup installer for KB977206 from the direct download links below. After installation, user may have to restart your computer. There is no change to the code bits of Windows Virtual PC and Windows XP Mode. Check out the official direct download links for Windows Virtual PC and Windows XP Mode.